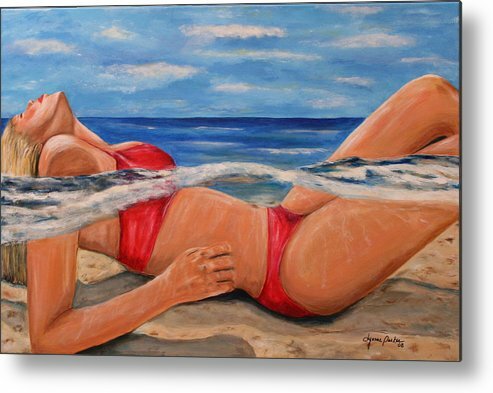 Perfect Spa by Dyanne Parker - 10.000" x 6.625"
Perfect Spa metal print by Dyanne Parker. Bring your artwork to life with the stylish lines and added depth of a metal print. Your image gets printed directly onto a sheet of 1/16" thick aluminum. The aluminum sheet is offset from the wall by a 3/4" thick wooden frame which is attached to the back. The high gloss of the aluminum sheet complements the rich colors of any image to produce stunning results. Dyanne, this is excellent. Love the reflection of underwater is very creative. Lovely, makes me want to lay in the water at the beach, Karen. Excellent work. Love the perspective. Beautiful painting with a creative perspective. Fantastic work of art Dyanne, marvellous feel to it. Great color and angle of view to the subject. Have fun doing your artwork, we love it. This is conceptually very interesting! What fun!!!! Perfect Spa cannot be created in any salon. Only the ocean can offer perfect relaxation and this girl understands the love of the ocean. Acrylic on canvas sealed with sustainable coat. Can be displayed indoor or outdoor. "Art is the most sustainable possession you can own". I am a self-taught artist with the initial inspiration from a woman who has been painting for over fifty years. I believe that whatever you do in life, enthusiasm and energy determines how successful you will be. Serving the corporate world for decades as a CEO and working with businesses of all sizes has given me life experience that inspires timeless art. Whether painting portraits of life heroes or capturing once in a lifetime moments, capturing emotion on canvas makes art the most sustainable possession you can own. Thank you for visiting & may your world be filled with art.